Funding will be used for canal lining and piping, installation of advanced metering, automated gates, and control systems to improve water management. Pipe being used to convert from open canals to make them more efficient. Conserving water through improving water and energy efficiency is important to help communities stretch limited water supplies. Acting Commissioner Alan Mikkelsen announced that the Bureau of Reclamation has selected $20.9 million for 43 projects to water delivery efficiency improvements in the Western United States. When leveraged with non-Federal funding sources these projects will complete more than $101 million in improvements. The selected projects will include canal lining and piping to reduce seepage losses, automated gates and control systems, and installation of advanced metering. "Conserving water through improving water and energy efficiency is important to help communities stretch limited water supplies," Acting Commissioner Mikkelsen said. "Through the projects announced today, Reclamation is helping local water managers with another tool in the toolkit to meet the ever-growing water demands." A complete list of selected projects is available at https://www.usbr.gov/watersmart. Water and energy efficiency grants focus on projects that improve water management, including projects that save water. Projects may also mitigate conflict in areas at risk of future water conflict and accomplish other benefits that contribute to water supply sustainability in the Western United States. Others result in water delivery improvements that facilitate future on-farm improvements, which can be carried out with the assistance of the U.S. Department of Agriculture’s Natural Resources Conservation Service to accomplish coordinated water conservation improvements. 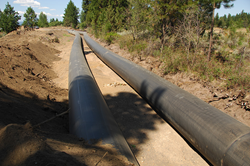 The Lower Tule River Irrigation District in Tulare, California, will receive $1 million to pipe 2.3 miles of the earthen Lateral B Service Area and 3.6 miles of earthen Lateral C Service Area. This project is expected to save 9,216 acre-feet of water annually that is currently lost to seepage, which will reduce the district's need for groundwater. The North Snake Ground Water District near Twin Falls, Idaho, will receive $296,454 to install advanced water flow measurement devices on 120 groundwater wells that are owned or operated by individuals within the district. The project is expected to conserve 3,130 acre-feet of water annually by increasing flow measurement accuracy and better documenting groundwater withdrawals. WaterSMART aims to improve water conservation and sustainability, helping water resource managers make sound decisions about water use. The program identifies strategies to ensure this generation and future ones will have sufficient amounts of clean water for drinking, economic activities, recreation and ecosystem health. The program also identifies adaptive measures to address climate change and its impact on future water demands. To learn more, please visit http://www.usbr.gov/watersmart.